Los Angeles truck accident lawyer Allen Vaysberg provides free consultations to the injured. If you have been injured and have questions, call him at 1-800-824-5416. Truck accidents can be very dangerous due to the large size and weight of the truck and the force of the impact that can occur as a result. Truck driver skills vary; sometimes they are not as attentive as they should be due to pressures from their employer to deliver the goods that are being transported within a certain period of time. Not only that, it is unfortunately not uncommon for a truck driver to be driving on little or even no sleep. How long to truck accidents take to complete in California? This page is about commercial truck accidents. A commercial truck is a large vehicle that can weigh as much as 25 times as much as a normal vehicle. 18 wheelers, big rigs, and tractor trailers are all types of commercial trucks. Commercial trucks are typically carry freight, hazardous material, or other various shipments. Driver and trucking company safety records. Driver’s amount of scheduled sleep. Improper weight distribution of freight on the truck. Faulty road design or maintenance. Defective engine parts or tires. 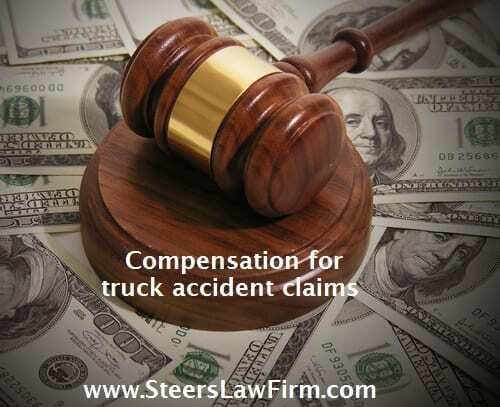 If you have been injured in a truck accident, let the Law Offices of Steers & Associates help make sure that you are not taken advantage by the trucking company and its insurance company. We will fight to help make sure that you get the just compensation that you are entitled to for your injuries and damages due to the careless driving of a truck driver. The truck accident attorneys at the Law Offices of Steers & Associates are experienced attorneys who focus on personal injury cases that are the result of someone’s negligence. 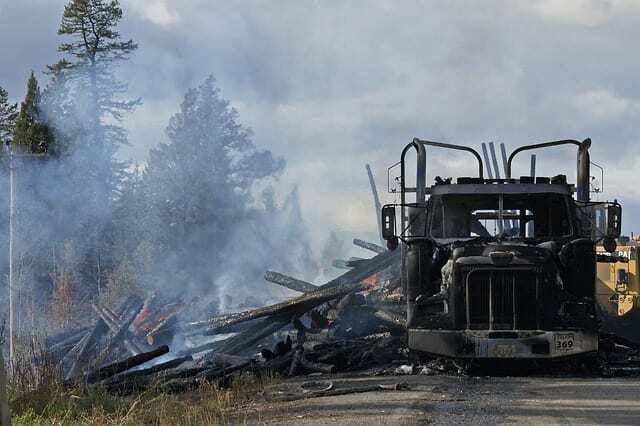 If you or a loved one has been involved in a truck accident, it is important to retain seasoned representation that will provide you with the best outcome possible in the court of law. What are The Qualities To Look For when Retaining an Attorney For a Truck Accident Claim? It is important to look for someone who is dedicated to representing their client and is committed to trying to get the best result possible. You want to hire someone that knows the law but also has a creative mind to try to get that person the maximum recovery that they are legally entitled to. People should hire an attorney they trust. After hiring the attorney, people should follow the attorney’s advice on how best to proceed with the case. Clients should be able to reach out to their lawyer and get their questions answered in a timely manner. Can An Attorney Help Negotiate Down the Medical Bills of the Client? A lot of times attorneys may negotiate with the medical providers including hospitals, doctors, chiropractors, imaging facilities, surgeons and/or other specialists. We are typically able to reduce clients’ medical bills once the case settles depending on the amount of a settlement or recovery. How long do truck accidents take to complete in California? A truck accident claim or case can take longer to resolve than a smaller car accident claim. If the injuries in a truck accident are serious, often times a lawsuit will have to be filed to try to obtain full and fair compensation.This is because an insurance company may not want to justify a decision to pay a large settlement until forced to do so. Insurance adjusters have to show to their supervisors that their evaluation and handling of the claim was reasonable in deciding to authorize a settlement amount. In a case where a lawsuit has to be filed, the resolution of the case can take 18 to 24 months, especially if we are talking about a case with significant injuries. In cases involving serious injuries, the scope and extent of the injuries and the effect they have had on the injured person’s life have to be adequately documented and supported by qualified experts in order to help obtain fair compensation in the case. It is important to know that trucking companies and their insurance carriers may not provide you with a just offer, especially if you are trying to obtain compensation on your own.. The Law Offices of Steers & Associates offers our legal services on truck accident cases on a contingency fee basis. When a settlement for damages is secured, the firm’s legal fees will be covered by an agreed upon percentage of the financial compensation to the client. If you have been seriously injured in a truck accident, contact our offices today to schedule a free consultation. What Can an Injured Person Do to Accurately Document Their Injuries? We recommend that injured people keep a log or a journal of their injuries and that they let us know of any limitations on their activities.Maybe there are certain things they love to do for fun or hobbies that they have. If they can no longer due those things or are limited from doing those things due to an injury accident, this is important to document because these things can be compensated under the law. Later on when it becomes time to try to resolve a case, we will show the other side either during settlement negotiations, mediation or trial the full extent of clients’ injuries whether physical, mental and/or emotional. The inability to enjoy activities and functions of life that were being experienced before the accident is an important component of a case that needs to be conveyed. What Are The Difficult Aspects of Handling a Truck Accident Claim from An Attorney’s Perspective? With trucking accident cases we often seek to establish the procedures and protocols that the trucking companies have to follow and whether those procedures were not being followed in the particular case.Some cases are easier than others to show that. If a truck just rear ends somebody and fault is admitted, then the battle will typically revolve around the injuries and what the case is worth. But a lot of times these companies will try to deny that it is their fault by arguing that the truck driver was following procedures and the rules of the road. In that case,we would need to consult with and hire the appropriate liability experts to help establish fault on the part of the truck driver and trucking company as warranted by the facts. Any case can present its own unique challenges but we strive to do our best to rise to the occasion and meet challenges head on when representing people injured in truck accident cases. Are Truck Accidents A Common Occurrence In California? Truck Accidents happen throughout California. Car accidents are more common statistically because there are more cars on the road than trucks but there are many accidents involving trucks as well. Truck accidents can result in serious injuries and even death because of the mass involved due to the big weight of these trucks. The injuries can range from moderate to very serious injuries. They can be as severe as spinal injuries, brain damage, amputations, and rather serious type of injuries as well as death. A lot of times, an accident occurs with commercial trucks like big rig trucks or 18-wheelers, tractor-trailers or even garbage trucks. A lot of these accidents happen where the trucker is ignoring or not following safety procedures and guidelines. They maybe are not getting enough sleep because they have to meet delivery deadlines or taking drugs or other medication to try to stay awake or they are driving faster than they are supposed to in trying to meet their work obligations.The lack of sleep on the part of a truck driver can be a major problem that can cause accidents. It is not always the cause of the accident but it can certainly contribute to it if someone is driving on little to no sleep. Not getting enough sleep can adversely impact a driver’s reaction time and jeopardize the safety of other people on the road. Other common issues can involve failure to maintain brakes properly,lights, tires or other equipment. There are different scenarios that we see in these kinds of cases and unfortunately truck accidents can result in tragic outcomes. Do Truck Accidents Tend To Happen More During the Night Time? Truck accidents happen at night of course because of the lack of sleep issue but these drivers can sometimes be driving during the day time also with not enough sleep so it is going to happen at all times of day and night. The statistics show that large trucks like the 18-wheelers and big rigs are involved in a disproportionate amount of traffic deaths in our country. They are only 3% of the vehicles on the road but they are involved in a disproportionate percentage of traffic fatalities. A combination of not following safety procedures unsafe driving with not getting enough sleep in combination with the sheer mass of weight of these large trucks that can weigh up to 20 times as much as the passenger car can contribute to dangerous crashes. What Is The Typical Scenario Resulting in a Truck Accident? There are various scenarios but we’ve seen scenarios where a truck driver is not looking and makes a wide turn which causes a collision with another vehicle or even a pedestrian. Other scenarios occur where the trucker loses control over the truck because of lack of sleep. Other times, truckers may be driving too fast or not safe enough for conditions, or their brakes or other equipment are not maintained properly. A claim and if necessary a lawsuit will be filed against the truck driver but usually the driver is considered an employee or an agent of the trucking company that hired them. Based on that we would be able to also pursue a claim and/or lawsuit against the trucking company as well because the trucking companies are the one who typically have commercial insurance policies that provide insurance coverage that may compensate people injured in truck accidents. How Soon Should An Attorney Be Contacted Following An Accident? The injured person should contact an attorney as soon as they are able to if they are injured in an accident. This is especially true if the accident was caused by someone else’s wrong doing or negligence. The first thing that we recommend is that the person makes sure that they seek appropriate medical attention and get the necessary treatment as needed. Then after that we recommend that they speak to an attorney to go over their legal rights and then see if the attorney can help them. What Are The Common Misconceptions Regarding Big Rig And Commercial Vehicle Accidents? Sometimes people are worried about how they are going to be able to get the appropriate medical treatment after an accident. It is important for someone injured in a truck accident to get the medical treatment that they need as soon as possible, especially if they have serious injuries were sustained. It is the attorney’s job to try to verify that the truck company has insurance and they typically do. Usually there is a commercial policy covering the truck driver and truck company that has larger limits than an average individual policy. For this reason, the injured person can usually obtain more of the treatment that they may need than in some other types of accidents. People in accidents often don’t realize that they have options to try to get medical treatment and get help with that. They may think that they have to pay a lot of money upfront out of their own pocket. A lot of times that’s not required and although they are responsible for their medical bills, payment can be deferred until the case is resolved at a later point in time. Another common misconception we hear about is when people tell us that they thought they get obtain fair compensation for their injuries on their own without an attorney but then realized that the insurance company was playing “hardball” with them and wasn’t intending to fairly consider the value of the claim. The big mistake, not just for trucking accidents but for all kinds of accidents often occurs when someone thinks they can handle their case on their own without an attorney because they are at a disadvantage. People are disadvantaged trying to deal with the insurance company or a large company on their own. They need skilled legal representation to try to ensure that they maximize their recovery that they are entitled to under the law. Do People Feel Discouraged and Hopeless During an Ongoing Accident Claim? Most people we come across want an attorney’s help to get fully and fairly compensated for their injuries. If we are talking about a significant or a serious injury, people are usually focused on trying to get better. Of course if we are taking about life altering injuries or the death of a loved one, the consequences of an injury accident can be devastating. We always strive to be there for our clients every step of the way to guide them through the process. The ultimate goal is to get as much compensation as possible under the law and the facts of each particular case. Do accidents with large commercial vehicles often involve more damage? Truck accidents involve several different issues. If the truck is an eighteen wheeler, obviously, it will have more mass. They’re bigger in size than an average car or motorcycle, obviously. If a truck hits another object there could be a big impact or could cause a lot of trauma, unfortunately, to the victim of the accident. What if the truck driver was sleep-deprived or trained improperly? Often times, the training of the truck driver is important to look at. Did the trucking company give the driver proper training or not? Was the truck overloaded? Was there improper weight distribution of the freight on the truck? Was the driver of the truck sleep deprived? Do they have a commercial driver’s license? All or some of these factors may be looked to help establish fault against the truck driver and the trucking company. As far as liability issues, if a truck driver did something incorrectly or was driving incorrectly then we would pursue both the truck driver and the trucking company that they were working for, to pay compensation to the injured client. Typically trucking companies have insurance so that would be a pool of money to pursue there. If it’s a large trucking company then they may have sufficient assets even beyond insurance. They may be self-insured. That’s what we would typically look at to pursue compensation. What Are Some Notable Case Studies Involving Successfully Litigated Truck Accident Claims? We had a case where a gentleman was a passenger in a car that was pulled over on the side of a freeway because the driver of the car was helping somebody in front of him that had a flat tire. All of a sudden, a truck smashed into the car from behind resulting in serious injuries for our client. Our client had to file a lawsuit with our help to best pursue his legal rights.We ended up resolving the case but it took a lot of time because the extensive medical treatment our client had to get as well as the reality of doing battle with a large corporation and its insurance company to make sure ourclient got fairly compensated. Our client went through a tough time because he major injuries due to the accident, was unable to work because of his injuries, and his relationship was impacted with his family. Ultimately we were able to get a good result to our client’s satisfaction although he had to suffer a lot because of someone else’s carelessness. What Are The Benefits Of Hiring An Attorney For A Truck Accident Claim? Proving the other side is at fault is only the first step in the process, you have to also try to get fairly compensated for your damages which are the harms and losses that you’ve suffered due to the accident. Especially if you have serious injuries in a trucking accident, those losses can be substantial.The question is how are you going to convince the insurance company or trucking company to pay full value for your losses, what happens if they want to low ball and not offer enough money? Are you going to be able to represent yourself in court effectively? It is beneficial to consult an attorney and go over your legal options and see if you feel comfortable with the attorney to best represent your interests. If a person signs away their legal rights on their own with the insurance company by signing a release, then they no longer have a right in the future to get additional compensation for their injuries.If an injured person files a lawsuit without an attorney, they most likely will be at a strong disadvantage when dealing with the opposing side who will be represented by an attorney. These are examples of how and why hiring an attorney is often the best step to take after an injury accident. What are the Common Client Concerns When Retaining An Attorney for a Truck Accident Claim? People injured in truck accidents are often worried about their injuries and the symptoms they are having. Some people have brain injuries including concussions and post-concussion symptoms. It is also common for people have spinal injuries to their back and neck. We also represent people with broken bones, torn ligaments and other serious injuries. Certain injuries may require surgery and additional treatment in the years ahead. A lot of people with serious injuries cannot go back to work and lose income because of their injuries in an accident. Many times, injured people have changed relationships with their family members where they can’t be there for their spouse, children and other loved ones like they were before. We always strive to keep in mind the serious consequences of an injury accident and how to best help people in that position. What Are The Rules And Guidelines Pertinent To Commercial Driving License Holders In California? Commercial truck drivers are supposed to get specialized training and follow special safety regulations which oversee how they should drive. We have found that truckers and trucking companies often will not follow these laws and safety procedures because they are trying to meet their strict delivery requirements and deadlines. When pursuing cases against a truck driver and truck company for clients, we have to look at the safety procedures and protocols whether they were followed or not. If they were not followed, this strengthens the case for our clients in proving liability against the truck driver and trucking company. Is It Advisable To Speak With The At Fault Party’s Insurance? It is advisable for the injured person to speak to an attorney first to see if they have a case and if they do hire the attorney then they follow the attorney’s advice. Once an attorney is hired he or she notifies the insurance company of that representation. From that point on, the insurance company is not supposed to contact the injured person directly. Does the Person Have to Give a Statement to their Own Insurance Company? Yes, if the person’s own insurance company is asking for a statement about how the accident happened. Virtually all insurance policies require a duty of the insured to cooperate. The attorneys can coordinate that statement to be given with the attorneys on the phone line as well, or if it’s an in person statement with the attorneys present. If it’s the other side’s insurance requesting a statement, there is no duty to cooperate and our office generally does not allow for recorded statements to the other side’s insurance company. We usually don’t allow a recorded statement to the other insurance company because doing so would give the other side and their insurance company a second bite at the apple if later there is a lawsuit that is filed. Once a lawsuit is filed, there is a right by each side to take a deposition of the other party. This is done under penalty of perjury and the testimony gets transcribed in a booklet and can be videotaped. What Happens If the Value of the Case Exceeds the Insurance Limits? If the injured person’s claim/case is greater than the insurance policy limits, that can raise some issues. Usually in trucking accident cases, we don’t see where the trucking company has less insurance coverage than the medical bills but sometimes the person has catastrophic injuries and their future medical needs are so great that the insurance policy of the trucking company still may not be enough to fairly compensate the person for their injuries they may have for the rest of their life. At that point, we would examine what assets the trucking company has in addition to the applicable insurance policy limits. There are times where the trucking company will not want to pay the maximum under their insurance policy limits because the insurance company decides they don’t want to pay that amount even though the injured person’s case is worth more than that. Then, if we demand the maximum under the insurance policy and the trucking company refuses to pay, our client could have a good argument that the insurance policy is now open. This means that the injured client can pursue the full value of what the case may be worth and later on if we get a verdict for more than the policy limits, the insurance company for the trucking company will have to pay or risk being sued for bad faith by the trucking company insured for not paying for the limits of the insurance policy when there was a reasonable opportunity to do so. What Is The Difference Between A Truck Accident And A Regular Auto Accident? An accident involving a commercial vehicle like a truck as opposed to an accident involving just a regular car is often much more serious. The injuries that we see with trucking accidents on average can be much more severe than in a typical car accident. It doesn’t mean we don’t see major injuries in car accidents as well. But all too often, because of the sheer weight and mass of these large trucks, they can result in horrific injuries. What are The Factors that Can Help a Personal Injury Claim for a Client? It is important for the injured person to work with their lawyer. We look at each case as a team effort between us and our clients.If someone is seriously injured, hopefully they have someone in their family or circle of friends that can be that point of contact to help assist with the communication with their attorney.Especially in serious injury cases,it is really a team effort.It requires coordination to get the appropriate medical treatment scheduled as well as to obtain the necessary evidence that the case may require such as witness information and statements, photographs, videos, and the hiring of the appropriate experts. Is It Advisable To Settle A Claim Right Away? If you have a good case meaning it can be proven that it’s the other side’s fault and you have sustained injuries, it’s usually not a good idea to settle right away. Often times, especially if someone injured in an accident is trying to settle with an insurance company on their own, the insurance company will offer them cents on the dollar of what the claim is really worth with the hope that the injured person doesn’t hire a lawyer.If the injured person signs a bodily injury release, they are waiving their legal rights to get additional compensation in the future. A lot of times the person is still in shock or dealing with their injuries after an accident and they are not going to be in a good shape mentally or physically to make a decision to settle without the assistance of a lawyer. Someone who has skilled legal expertise is often best equipped to help an injured person to maximize their recovery, especially after an accident with serious injuries. How Do Personal Injury Attorneys Get Paid for Truck Accident Cases? We have a contingency fee for injured clients for personal injury cases whether it’s trucking accidents or other types of accidents like car accidents, motorcycle accidents, wrongful death and pedestrian accidents. How that contingency fee works is that we get a percentage of the recovery and we don’t get paid until there is a recovery. If there is no recovery, we don’t get a percentage because there is nothing to recover from. So that way we are able to help our clients get legal representation that otherwise they may not be able to afford. Which types of trucks are involved in accidents in Los Angeles? Los Angeles is a major hub of international trade. As such, Long haul, OTR, regional, dedicated, and local truckers pass through all major roads in Los Angeles, carrying many types of freight, livestock, and shipments. Just a few of the trucks passing through LA and Los Angeles County include Con-Way, DHL, UPS, FedEx, Crete, Interstate, J. B. Hunt, YRC, Swift, and Old Dominion. What about trucking accidents in construction zones? Other truck accidents may involve garbage trucks, dump trucks, and jackknifing accidents. 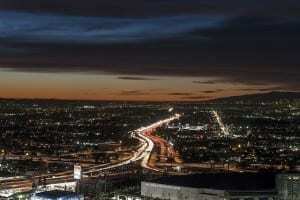 Los Angeles has many congested freeways contributing to the stress of driving. Many truckers attempt to avoid rush hours however everyone knows that 18 wheelers and freight trucks must travel and end up on congested interstates and highways. Some of the most congested roads in LA are on the Harbor Freeway, San Diego Freeway, San Gabriel River Freeway, Santa Monica Freeway, and many areas of Interstate 110, 405, 605, & 10. We represent truck accident clients anywhere in California. That said, many of our clients are here in Los Angeles or the nearby cities of Beverly Hills, Pasadena, Glendale, Alhambra, Whittier, Encino, Hollywood, Moreno Valley, Huntington Beach, Garden Grove, Fontana, Baldwin Park, Long Beach, Riverside, San Bernardino and around Southern California.